I recently watched the Minimalist’s documentary Minimalism: A Documentary About the Important Things. It’s inspirational and it helped keep the fire lit under me as I sell many of my possessions. 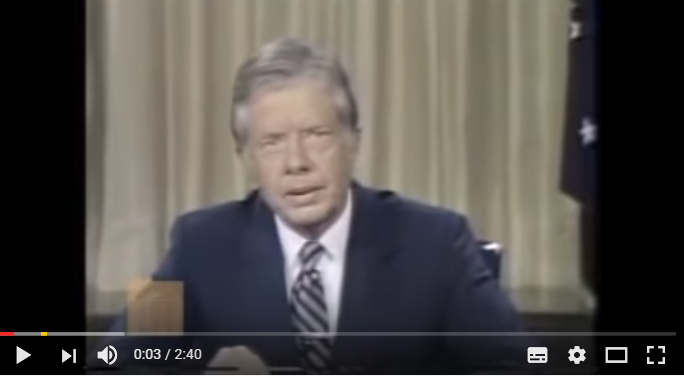 It was a clip in the documentary of Jimmy Carter addressing the nation in 15 July 1979 and a reminder of same on Twitter, however, that really caught my attention. There is something very prescient about listening to or watching a clip and feeling in that moment like that person is speaking directly to you. Especially when it was created years before you even existed. His address focused on warning about the threat of consumerism. The version with music is best, akin to THE version of the Pale Blue Dot. The broader issue of what we are doing to ourselves and this planet is emotive and needs to be felt, not just known. Combining the message with the right music is very effective and opens up more senses to its contents. I don’t live in the US and can only claim the understanding of a relatively interested outsider in its politics. Current circumstances would suggest that the very heart and soul of what it stands for as a nation is under assault, and that fact can no longer be hidden or obscured in rhetoric. The elevation of ‘the market’ in importance above the people it is supposed to serve drives the conditions whereby consumption becomes synonymous with life. Over time, literally everything has a price and monetary value. Life becomes a unit of resource for the global machine. It is a matter of misguided absolute principle over commonsense, connected, and fair reality. The difference between what the market can offer, and genuine, authentic existence is surely what engenders this ‘crisis of confidence’ that is rocking individuals and whole nations. Individual loss of confidence in the meaning of life when one has to work three low-wage jobs just to afford to live. Loss of confidence in a Government whose primary focus of existential meaning is cruelly removing your healthcare and undermining the conditions of your daily existence. Loss of confidence as the rich simply get richer and those at the bottom struggle for the leftovers. The confusion of voting against your own interests for those same people whose priority is everything but acting for you, or solving actual problems. Yes, one should be rewarded for effort and success. Efficiency is good, waste is bad. This does not, on any fair reading, imply a right to resources that disproportionately and massively impoverishes others both living and to come in future generations. On an ever more crowded planet, if democratic countries are to remain with the balance of power, there is also an onus on citizens to critically evaluate their day to day choices, and to whom they hand power. Especially to whom they hand power. So where does consumption come into this? The more engaged we are in constant consuming or surrounded by a society that places consumption at the heart of its values, the more difficult it is to imagine another way of doing things. In fact, overconsumption of anything might directly affect our ability to imagine in the first place. That is why the message from Jimmy Carter strikes so hard now; it is even more true today than it was back then. As Terence McKenna puts it, ‘stop consuming culture, and take back your own mind’. What does it mean to do this across the vast range of individual needs, wants, situations, and experiences? That’s a question each can only answer for themselves. I have no doubt that adopting a conscious approach to consumption is an early chapter in the journey. Simple living, minimalism, frugality, whatever words you want to slap on it. That alone might change your life. Amidst a life of positive action and achievement, it appears the one thing Jimmy Carter hasn’t chosen is the materialistic trappings he no doubt so easily could have.